Another creation from a solid tarot team is the Fantastical Creatures Tarot. From the obvious power of the Winged Lion standing as the Sun to the delicate fairy who sit by the Ace of Cups, these cards are mesmerizing. Hunt’s artwork has long been a favorite of mine. She has a way of imbuing her art with intricate images that demand your attention. She is well known in the Tarot world for good reason. Physically this deck is standard US Games fare which is to say it is a sturdy deck that you won’t have to worry about falling apart at first shuffly. Two cards are quick reference cards–one for the Major Arcana and one for the Minor. This makes this a great gift deck for someone who wants to learn more about the Tarot who also has a love for all things mystical and magical. There’s humor abounding in this deck as well. Hunt’s rendition of the Five of Swords had me laughing outloud. I didn’t know the creature but its turtle-like back, slightly cantankerous look set in a swamp captured a contentious 5 of Swords for me. When I consulted the LWB, I was greeted by the Kappa who is a Japanese creature. Some of the meanings are not what I would call traditional but none of them went too far astray of the area of meaning. One major difference is in the Major most decks name Devil. Here instead we have Fenris Wolf on the card named Chains. Since Chains are a major element of the Devil, it was a good choice in my book. As one of Loki’s children, Fenris has many lessons about why you might be chained. Circe is a favorite character of mine so I love this image of her surrounded by the animals she so loves. The colors are soft without being bland. While I would classify this an an art deck, it is also a deck to be studied and worked with. It will bring nuances to your knowledge of Tarot, as well as expand your mythological horizons. I highly recommend Fantastical Creatures Tarot. The Fantastical Creatures Deck is one that pulls together in such a fresh, innovative, positive way, it both pleased and surprised me. I am a firm RW/UW reader, and I am generally leery of "dragony" decks. 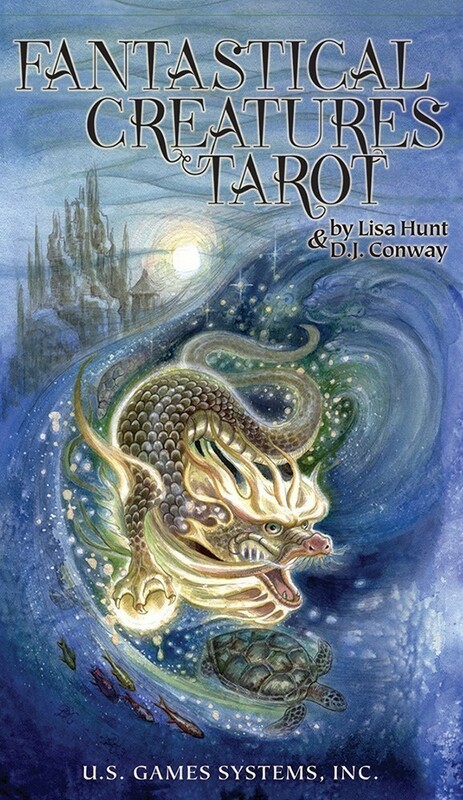 I first saw this deck on Aeclectic, and was intrigued enough to learn that the author was D. J. Conway (Celtic Dragon Tarot), with art by Lisa Hunt in her fantastic style. I went to U.S. Games (the manufacturer) to investigate more, and as a sign from the Goddess that I should have this deck, Lo and Behold, it was on sale for a very nice price! I clicked "Buy" immediately. I can sum this terrific deck up in one word before going into depth about how informative and positive it is: WOW! The cards themselves are a fairly firm stock, they fit well in the hand, and the back is a lovely beige with an oriental filigree circle that prevents the reader or querent from knowing reversals ahead of time. Nice extras include a glossy layout sheet with innovative tarot spreads: Changes is a 5-card layout to help deal with change and transformation, and there's also a 5-card layout for present life challenges. Two other very interesting ones are the Pyramid, which purports to show past, present, and future lives (or the past, present, and future in this life), and the Decision layout, consisting of 3 rows of three cards each, which show ultimately what could happen due to the actions we take on the cards (Isn't that what Tarot Reading is all about?). Although I would classify this as a Rider-Waite style deck, this one is much less ominous. 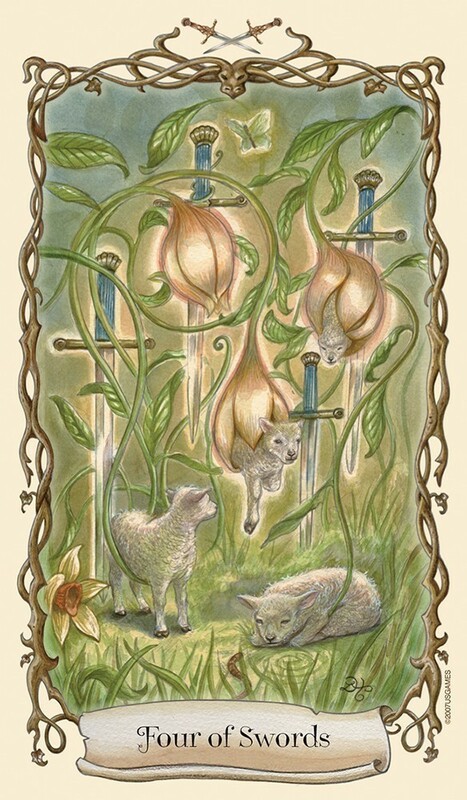 The creators have no reversed meanings, and for each card there is a "magickal use," which involves some type of meditation, or possibly a spell related to the meaning of the card, intended to heal the pain of the querent. I have so many favorite cards in this deck! They are so well chosen, that some I had never heard of, and I learned quite a bit. Examining the Lower Arcana was a delightful job, and it's difficult to choose only a few to highlight. Gratefully, this deck taught me about the tenga of the Shintu oriental religion (Five of Wands), and also about the female Valkyries (Seven of Wands). 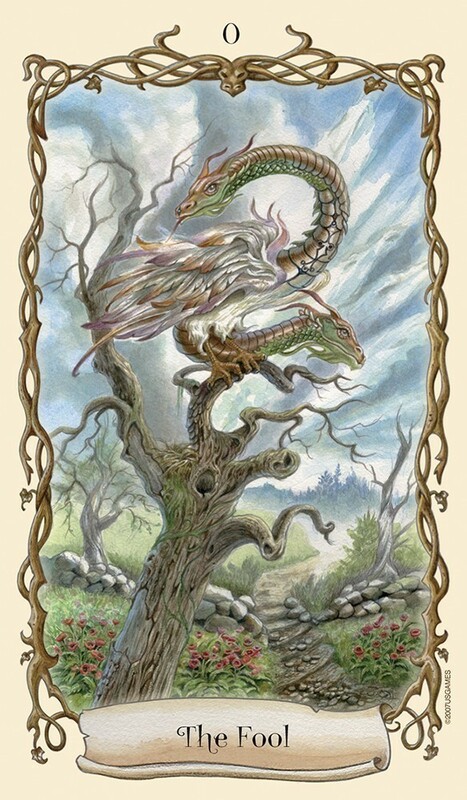 I particularly love the Griffin as the Nine of Wands, which neutralizes any negative cards in the layout and enhances any positive ones. I say "Bravo!" to this deck, and I recommend it to Rider-Waite fans who have been hungering for a little of the fantasy stuff. ”The Fantastical Creatures Tarot” was a Top Ten Deck for its year of publication (2007) – for good reason! This is a magickal deck – a portal into other worlds. The basis for this deck is the theme of mythical/fantasy beings, and the myth and lore surrounding them. The artwork is done in a gentle, very detailed fantasy style, using watercolors. There is a mystical, other-worldly feeling to this deck that just draws you in! Lisa’s art is so good, on so many levels – it is hard to know where to begin! One of my favorite things are the winged creatures (and human figures) – the High Priestess as a winged serpent, the Emperor as a winged horse, the winged lion on the Sun, the winged Centaurs on the Chariot, the winged female figure in the Star, the winged figure on the Four of Wands, the winged Queen of Wands, the winged Knight of Wands, the winged Nine of Wands, the winged Page of Pentacles, and the winged High Priest. The detail in this deck is very well done – each time you study a card you see something new and different! I feel that this deck would appeal to those with a basic understanding of Tarot who wanted to work with a fantasy theme, those who are attracted to fantasy themes/artwork, or those who wanted a gentle alternative/comparative deck. This is a wonderful deck for ritual, meditation or journeying. Those who were drawn to Lisa Hunt’s previous decks will no doubt also enjoy the Fantastical Creatures Tarot. The lack of a full companion book may be a hindrance for some, but the set should suit the intermediate tarot reader who enjoys fantastical imagery and more intuitive readings. I took my time in getting to know this deck, although I was drawn to it immediately. As its title suggests, this is a deck of fantastical creatures. 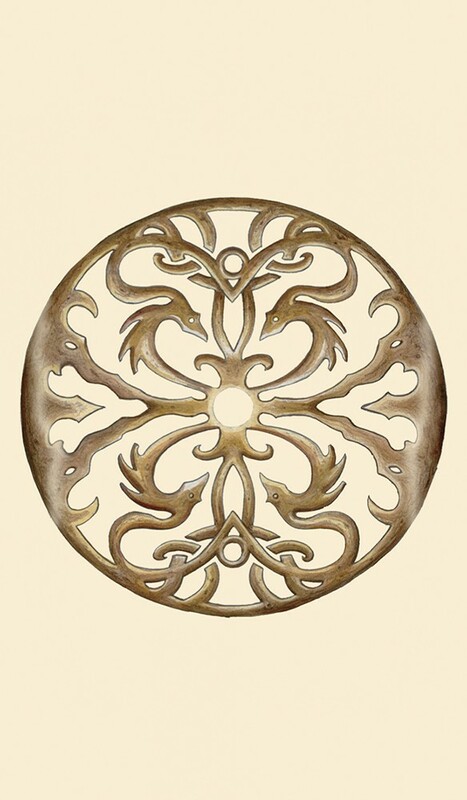 They come from around the world and throughout time, invoked from myth and folktale. Each has a lesson, or reason for being in this deck, and each in its own way will guide or inspire. What the title of the deck does not indicate is just how immersive these cards can be. This is not simply a "theme" deck - there is a complete world - or other-world - here, accessible to us, as inquiring travelers. The Fantastical Creatures Tarot offers a connection to the energies of the many mythical beings found within it, and provides suggestions on "tapping into" these sources for their assistance in our lives. This very magickal element of the deck is important - it shows us something that is spiritually alive, so when we read with these cards we may (by our choice, and depending on our beliefs) be doing far more than understanding symbols, interpreting meanings, or engaging our intuition; we might be communicating with certain ancient powers. Both the artist, Lisa Hunt, and the author, D.J. Conway, have done a terrific job in portraying these fantastical creatures. Hunt's artwork is detailed and accomplished, as well as warm, joyful, ethereal, and transformative. The images express an obvious love she has for her "subjects," and that feeling is rather infectious. The images are full of symbols - some standard for the tarot, some unique to this deck, which Conway comments on thoroughly in the little white booklet. Conway's treatment of the deck is instructional and insightful. She introduces us to each fantastical creature, offering a bit of its history and significance, describes the symbols on each card, and suggests divinatory meanings for when the cards turn up in readings. She also suggests magickal uses for each card, which might entail meditation on a card, or use in a spell or ritual. The little white booklet is quite comprehensive - much information is provided in its small pages. It is enjoyable simply to read about the great variety of mythical creatures in the deck. 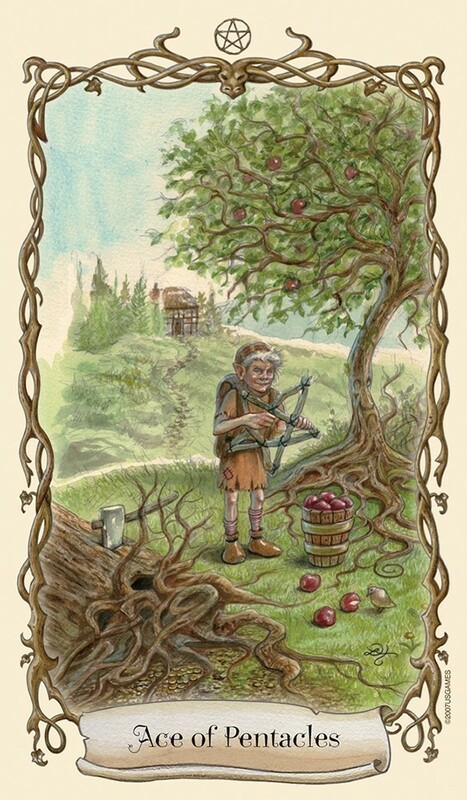 The fully illustrated cards of the Minor Arcana exhibit equal creativity and insight, and uniqueness in imagery as well as interpretation. 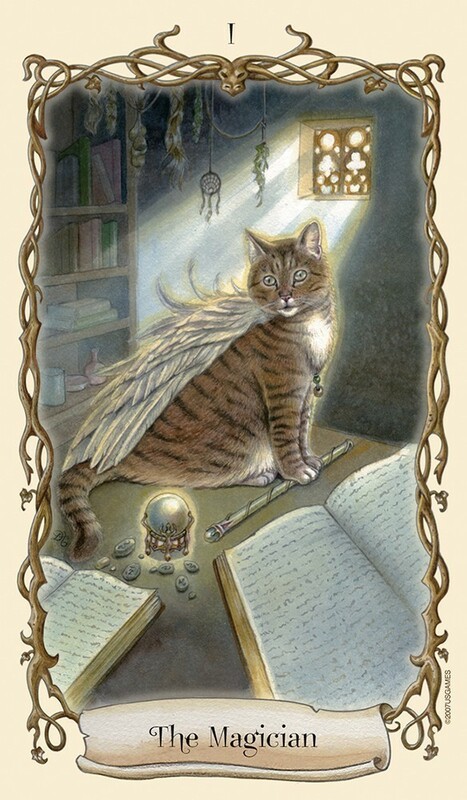 All of the cards come together to form a beautiful whole, and readings conducted with the deck feel touched with the spirit of these wondrous creatures. Included with the deck are two "quick reference guide" cards, and a very attractive, useful layout sheet that demonstrates five layouts and offers tips on conducting readings. This is a truly lovely set that offers a spiritual presence as well as aesthetic beauty. It is highly accessible, with the versatility to go beyond everyday readings. I would strongly recommend the Fantastical Creatures Tarot. It may seem that the world of Tarot is entirely overrun with copycat decks and deck "creators" who barely know a thing about magick and mysticism. That is not the case with this deck. First of all, this deck is really original. The Fantastical Creatures are not ones you have heard of, at least not most of them. But that is only part of what makes this deck so exciting. 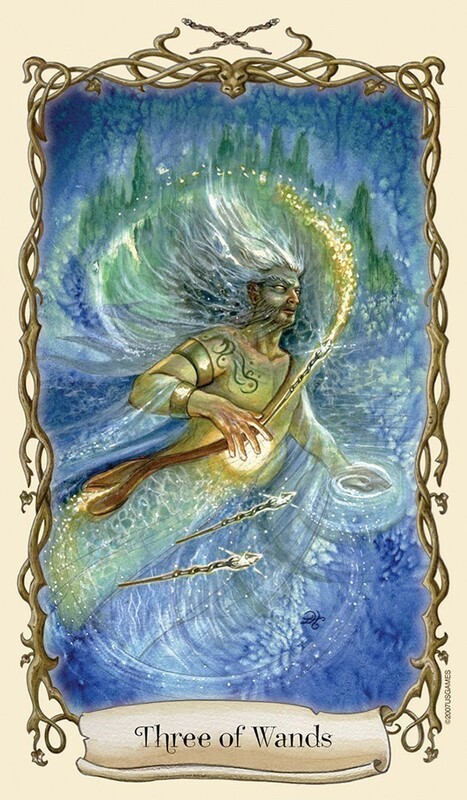 The fact is that after more than a decade as a Tarot reader, a Witch, a Ceremonial Magician, and a student the Foundation for Shamanic Studies, I see in this deck that Conway grasps the underlying mystical, magickal sense of each card more fully and deeply than, really, almost anybody else out there who has produced a Tarot deck. 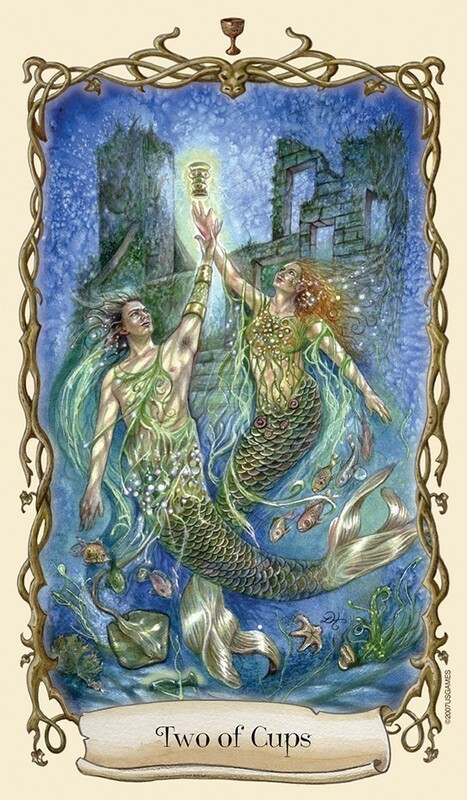 I feel that the Fantastical Creatures Tarot is comparable in depth to the Haindl. And the artwork is just gorgeous; the scenes are enthralling, and the quality of the cards themselves is excellent, too. All in all, a great deck. This is a wonderful, mystical deck. I almost did not buy it because other reviews warned "this is not a beginners deck" and that it did not line up with traditional decks. However the deck kept calling out to me so I purchased it. I am a beginner and I find this deck teaches me and leads me to greater understandings. I would have to agree that this is not a "beginners deck" because it is the most slippery, tricky, insightful deck I have come across. It has a very definite personality. This deck, for me anyway, gives deeply incisive readings full of sassy and sometimes humorous insight. If you enjoy a deck with personality and are not put off that it has a mind of it's own (very stubborn! - it keeps saying what it wants when it wants!) then this deck is wonderful. It will show you deeply (too deep for most people as it shows stuff you don't want to confront or admit even to yourself!). But beware - this deck is sassy!!! The artwork is absolutely gorgeous. It does not try to follow tradition, but I find they speak wonderfully to my intuition. The only real break is with arcane 15 which is renamed "chains" but I personally like this change and find it consistent with the readings. One final warning: those that want to keep their belief in the lie of the material universe walk away and do not purchase this deck. As Friedrich Nietzsche so eloquently says: "When you look into the abyss, the abyss also looks into you."